Video Blog A VEGETARIAN on PASSOVER? Are We COMMANDED To Eat Lamb? 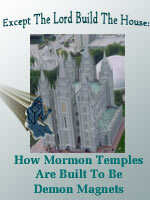 From the Salt Lake Capstone Conference of 1988, Bill discusses the incredible secrets revealed by details of LDS(Mormon) temple architecture. He explains why these most sacred of structures (by LDS standards) are actually covered with symbols related to witchcraft, Satanism and Freemasonry. Helpful charts and diagrams show how Satan has even left his signature on the architecture of Mormonism's most holy sites. Copyright With One Accord Ministries. All Rights Reserved. eCommerce Software by 3dcart.